What others say about chiropractic care can help you make the right health care choice. Review a selection of Berner Family Chiropractic patient cases below and please contact our Marietta / East Cobb office if you have any questions. Linda was diagnosed with Multiple Sclerosis and dealing with severe dizziness and numbness in her hands. Immediately after her adjustment, Linda was full of energy and balance. She felt she could run down the hall! 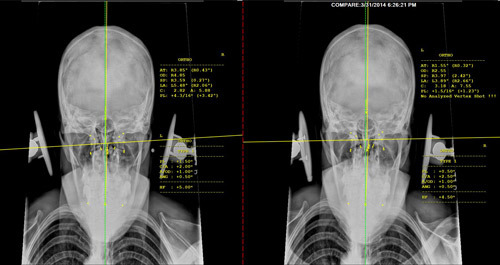 See Linda’s scans and here how things are going 6 months later in this video. Gene came to Dr. Berner from Mississippi and at 90 years old has enjoyed gentle adjustments that have changed her life! 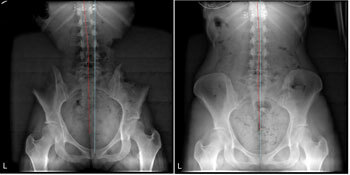 This patient suffered from fibromyalgia and was bedridden the better part of the last 7 years from extreme pain. She has made a complete turnaround in 1 month and is able to play with her child again and resume a normal life. You can see the obvious changes in both her thermography scans and cervical curve returning to normal. This patient flew down from Michigan to see us with extreme back pain and sciatica. Completely gone in 24 hours. Hear Sheryl tell her story about how her 30 year hearing loss was restored instantly after an adjustment. Daily Headaches & Leg Pain Gone! Teenager had daily headaches and pain down both legs. 100% gone since the first adjustment. As you can see why, virtually no motion in her neck when she and in. Following the adjustment the motion is greatly increased. This patient broke her back and ribs in a major car accident. Came in wearing a body cast. She suffered from extreme pain, 24/7 migraines, 1-2 hours of sleep per night, and was completely non functional for nearly 2 months before coming to see us. Soon after she noted she was better than before the car accident. 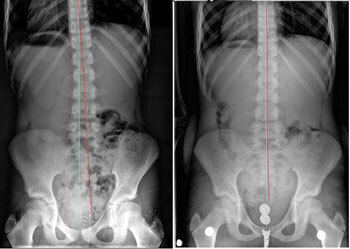 Low back and pelvis after 3 previous years of chiropractic care. Post x-ray taken after 8 weeks of care at Berner Family Chiropractic. Notice the red line approximates the blue (normal). 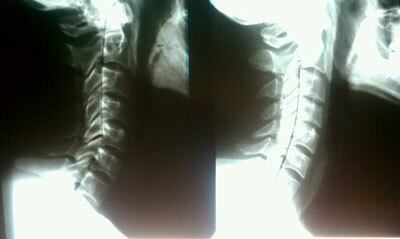 Patient with 15 year history of worsening tremors in the arms and extreme low back pain. Unable to drink a glass of water do to extreme shaking. Side view of neck shows very restricted motion when looking up. 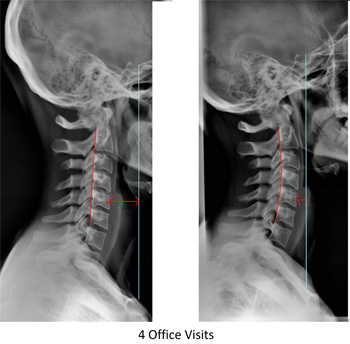 Four days later they were able to drink a glass of water for the 1st time in over a year and normal motion returned to the spine as the back of the skull approaches the shoulders. 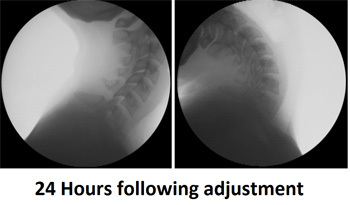 Normal neck curve is returning as front of the spine approaches the blue line. 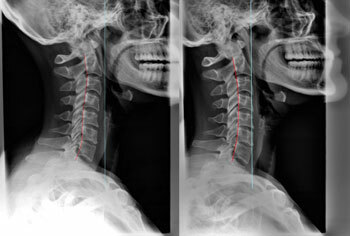 Side view of the neck under video x-ray still shot. Shows high school volleyball player in East Cobb, looking back at the ceiling as far as possible with major restriction evident. 24 hours following the adjustment later normal motion is restored. 12 year old having 3-4 migraines per week and missed nearly 2 months of school last year. 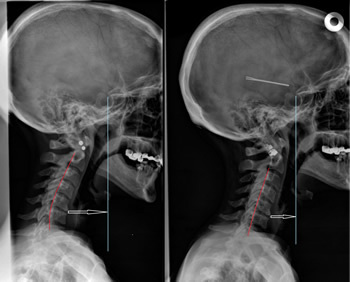 Side view of neck shows restriction in flexion and extension. 5 weeks later migraines gone and normal motion restored. 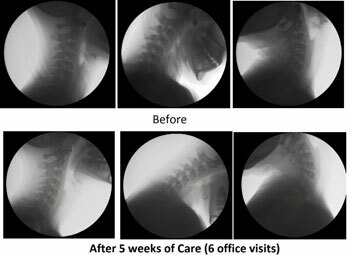 1 year of previous chiropractic care on average 2 times per week. 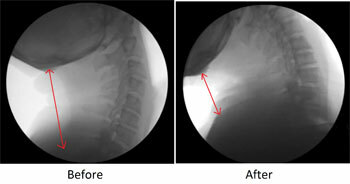 1 adjustment and 10 days later neck curve is almost fully restored, even with arthritis present in the neck. Patient traveled from Ohio and only in town for the weekend. Lower spine and pelvis were shifted. 1 adjustment and 48 hours later nearly complete correction. Thermography scans of the above case. 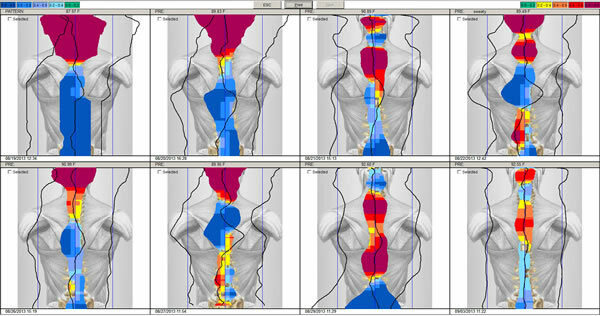 Temperature patterns along the spine balanced over the course of 48 hours. Upon last scan being nearly perfect, post x-ray taken. Upper Neck Causing Arm Pain – Corrected! Reverse upper neck causing pain into the arm. 8 visits later near complete correction.